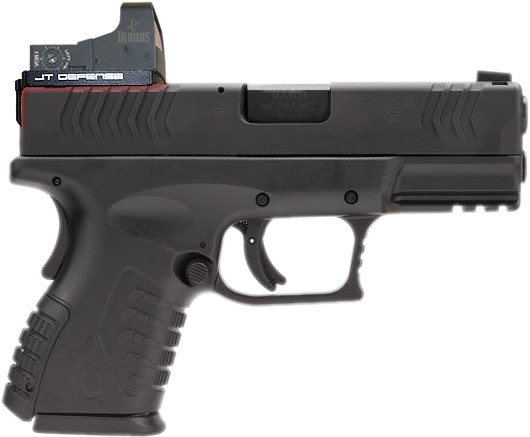 New, from JT Defense, the long awaited Red dot mount from JT Defense, allows Springfield XDM owners, the most secure way to mount a Red dot sight on their handgun, without machining the slide. The optic mount on this page, is for ALL Springfield XDM 9mm, 40 and 45, wide or narrow slide models, no matter the barrel length, or if the firearm is full size, compact, or sub-compact. This optic mount fits all Springfield XDM series handguns. If you are looking for a different optic mount click below. Can be removed in minutes, leaving no damage to the gun or finish. Returns the gun back to stock. Low profile mount, installs the red dot just above your slide, allowing for perfect bullet drop characteristics at range. Ultra-Rugged design, is not affected by vibration, hits or jarring of the slide, and will NEVER LOSE ZERO. Can be used for daily carry, or range plinking. Can install on all models of XDM handguns, by simply removing the rear sight and striker plate. Patent pending design, is the only mount in the world, that installs as strong as slide machining, at a fraction of the cost. 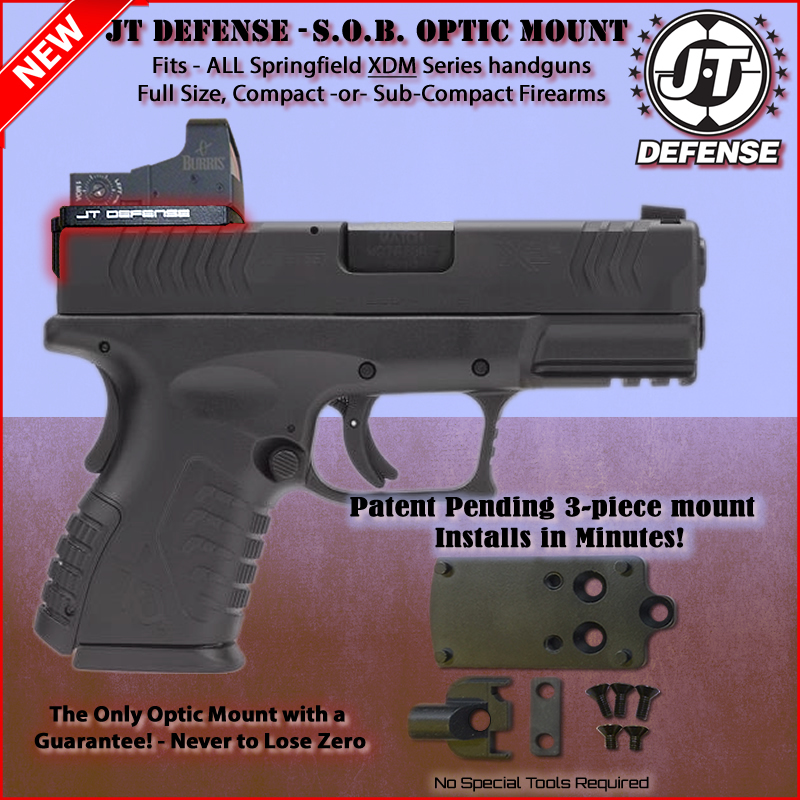 JT Defense's new, patented Striker, Optic, Base (SOB) Mount, for Springfield XDM, allows you to instantly and securely mount a low-profile red dot optic on your Springfield XDM, with the most secure mount in the industry. Brilliantly engineered out of billet aluminum on our CNC machines, the new XDM red dot mount for Springfield, allows XDM owners to instantly install with common hand tools, this new mount onto their Springfield handguns, any compatible red dot optic, which uses the Burris Fastfire II or Fastfire III compatible mount. Numerous red dot manufacturers use the same mount option as Burris Fastfire. We have engineered the only drop in mount in the industry, which is guaranteed to Never Lose Zero. Our red dot mount is so stable and so strong, you will destroy the optic or the gun, before our mount moves on your gun. JT Defense's patent pending rear insert and optic plate, allows you to utilize the design of your firearm's striker insert, to add a 3rd, ultra stable mounting location to your red dot mount, which guarantees that the mount will not not only stay "Welded" in place, it simply cannot move. The 3 mounting locations on our Springfield XDM mount, lock into your firearm's rear striker insert and the existing dovetail so strong, the opposing forces applied in a downward fashion in the dovetail, and in a forced upward downward fasion, locking the optic to the firearm so tight, that we don't even require the use of thread locking compound while installing the red dot mount. The only other method that is stronger, is sending your firearm out to a specialty machine shop, and physically and permanently modifying your Springfield XDM's slide, essentially destroying the firearm if you ever want to remove or install any other brand or style of optic. We are adamantly opposed to machining your handgun, just to put a red dot optic on it. JT Defense tested and re-tested all other optic mounts in the industry, and all other various methods to install a red dot optic on a variety of firearms, and found that the mounts consisted of either temporary mounts, consisting of a simple plate and dovetail, allowing you to install a red dot on your gun, sure, but after 50-100 rounds, all of the mounts tested either came loose and failed, or, damaged the finish on the firearm. JT Defense tested the standard, low-cost dovetail and baseplate, which installed with 2 simple screws, and found that this style mount, when installed on a heavy recoil Glock 20, 10mm firearm, either came loose, or completely lost zero after just 50-100 rounds. Even in the best case scenario, when installed with a well known thread locking compound, the optic mount came loose and almost fell off the firearm after a mere 165 rounds.The other option we tested, a combination built-in dovetail / optic plate mount, when pressed into place, completely damaged the slide's finish, and permanently marred the factory coating. This was not acceptible and we stopped testing, as it damages your firearm. All the simple plate mounts, will move. If you are using a traditional plate mount with single dovetail, they are a great, low-cost option to install a red dot onto your XDM, but they will move on your slide, and the red dot will lose zero, start shooting erratically, then, if the mount is not removed and tightened, it will come loose. During testing on the low cost mounts, we actually had a screw come loose, and the red dot and plate fell completely off the pistol. The low cost red dot plate manufacturers, came up with a new way to secure the red dot mounting plate to the slide, but this incorporated a set screw, on the top of the plate, that drives a screw directly into your slide. Yes, on our competitor's mounts, you actually require that you tighten a set screw, from the optic mount, into your slide's finish, and permanently damage your slide's finish. Your firearms, should be considered a lifetime investments. There is no reason you should ever consider permanently modifying or damaging your handgun's slide, to simply install the "Current technology" red dot on your firearm. 10 years ago, hunters and shooters, never imagined that we would have red dot optics or "Reflex Optics". The newest technology today, is to attach a modern red dot optic on your firearm to ensure you can hit the smallest point, on the smallest target possible. Tomorrow's technology however, could be completely different, or require a smaller, traditional mount, or even fit in the stock rear sight location. Heck, predicting the future, we could even have full holographic sights, that are so small, they can fit anywhere and provide a holographic red dot floating in mid-air. Fact is, we don't know where the future or evolution of the firearms and optic industry is heading, so why permanently modify your firearm, to accept an aftermarket optic, that the manufacturer or the technology could be gone tomorrow? Well, simply, you shouldn't, and that's why JT Defense has engineered, patented and produce the finest, high-end optic mount in the industry. Sure, it might cost slightly more than the competitor's simple 2 piece mount, but we put a lot of machining, time and effort into our Springfield XDM mount, to ensure you get the highest quality mount possible, with the most secure, low-profile mount we could produce, at a price that's just 1/4 of what you would spend to send your gun out to have it permanently modified to fit a specific manufacturer's optic. This red dot optic mount, fits all models of Burris Fastfire II and III, as well as Vortex Venom - Vortex Viper sights, EoTech MRDS, Primary Arms Red Dot optics, Docter Optic and many more. No adjustment necessary. Install, remove, re-stall and it will hold Zero with little or no adjustment necessary. Any red dot optic, that fits the standard Burris FastFire II or FastFire III mounting plate, will fit the SOB Mount. We will update this list as we actually find, fit and install these optics on our mounting plate. XDM - NARROW SLIDE - ALL 9mm Springfield XDM handguns. Slide is slightly narrower than all other models. NOTE: WILL NOT FIT Springfield XDM Models with Adjustable rear sights! You need a dovetail, standard optic mount to fit this. We will have a model out for XD/XDM with adjustable sights soon. Please contact us for further details.